Louisville’s alumnae play an essential role in preserving and advancing Louisville’s unique mission. As alumnae move forward in their lives, many look back on their experience at Louisville with deep appreciation and fond memories. Though some programs may have changed, alumnae recognize that the commitment to excellence, service and community, grounded in the values and charism of the Sisters of St. Louis, has remained the same over the years. Alumnae gifts, regardless of the size, demonstrate loyalty and support of Louisville’s commitment to providing the finest Catholic college preparatory education possible for young women in Southern California. By giving back to Louisville, alumnae not only celebrate their own experiences and accomplishments, they ensure that the tradition of lifelong friendships, coupled with academic excellence, will continue for generations to come. Honor the occasion by making a special gift during Reunion Weekend in gratitude for your Louisville High School education and the lifelong friendships you’ve made. 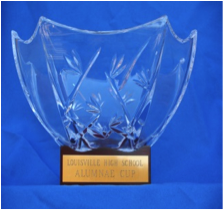 The reuniting class with the highest giving participation will be recipients of the Alumnae Cup! To make your Reunion gift, click the "GIVE ONLINE" button to your right on this page or click to the Give Back page (tab above).